Abilities: Genius-level intellect, superior discipline and control over his libido. 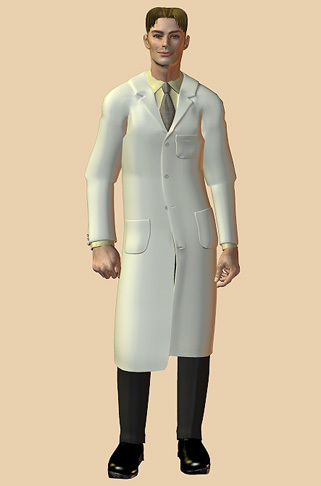 Dr. Digitalus is an unscrupulous graduate of Metrobay University, a former student of Dr. Gilbert Petto and Raquel Summers, and a contemporary of scientists Marcy Smith and Shelley Calvin. He greatly admired his predecessors, Belinda Giolla and Ted Twiss, wishing to follow in their footsteps. He was an extremely ambitious, anti-social young man with a burning drive to excel that quickly set him apart from the rest of his classmates, dedicated himself fully to his studies and lessons at the expense of friends, family, and a social life. While they were in school, Daniel once had a crush on Marcy Smith and asked her out. However, his poor approach resulted in a stout rejection, leaving him a broken heart and a bitter resentment towards his female counterparts. Despite starting school a year later than Marcy and Shelley, he graduated earlier, due to his almost overzealous work ethic. He quickly found a job as a technical supervisor at APEX Industries and rubbed shoulders with the likes of Max Indeks, who indulged the young man’s ambitious for success, power, and glory. After a stint there, Daniel transferred to the Department of Defense as a blackbox scientist, working on secret government projects that flew in the face of traditional morality and eugenics. It was here that Dr. Digitalus began to truly flex his wings and fly, using every last drop of government funded money to engage in bizarre and brilliant tests of science, creating more efficient technological weapons, combat gear, and vehicles. But that wasn’t enough for him. During a joint operation between the D.O.D. and APEX Labs back in Metrobay, he began to observe and study the Superheroine Squad and its associated heroine groups. Based on what he observed, he derived a new direction for how to secure the nation and how to protect its interests – he would make super soldiers out of these heroines by putting them complete under the government’s control. He decided that this type of biological weaponry was the path to the future. Rekindling his alliances with APEX and Max Indeks, who had themselves been researching genetic modification and cloning, they mutually agreeing to help the others research. Dr. Digitalus carefully chose the Capital City heroine American Amazon because of her ties with the Metrobay heroines and the fact that she resides in Capital City. She was an experienced crime-fighter but relatively naive to the joint underbelly workings of the government and other deviant companies like Apex Labs. She was perfect to be the first of his guinea pigs. After an elaborate and drawn out series of events and planning, he eventually captured American Amazon. Once in his grasp, he subtly and effectively brainwashed her into becoming living “government property”, hoping she’d be the first of many superheroines captured, converted, and controlled into becoming effective bio-weapons, all for the benefit of society, of course.